Gandrīz visas plītis ir aprīkotas ar elektrisku aizdedzi. Gāzi aizdedzina elektriska dzirkstele, kas rodas deglī ieslēgšanas momentā. Dārgos modeļos elektrisko aizdedzi izmanto gan plītsriņķiem, gan gāzes degļiem cepeškrāsnī. Tas maksimāli vienkāršo plīts lietošanu. Ir divu veidu cepeškrāsnis: gāzes un elektriskās. Elektrisko cepeškrāšņu apakštips ir elektriskās daudzfunkcionālās. Daudzfunkcionālās cepeškrāsnis sniedz plašu gatavošanas iespēju izvēli. Cepeškrāsns augšdaļā var būt grils un iesms, tai var būt konvekcija. Programmu un režīmu skaits, kādos var pagatavot ēdienu. Gāzes grils ir ekonomiskāks par elektrisko. Grilā ēdiens tiek gatavots kā uz oglēm. Rotējošu iesmu izmanto lielu gaļas gabalu, zivs gatavošanai. Temperatūras iestatījums tiek sasniegts automātiski un konstantu to uztur termostats (ko kontrolē regulators). Tas ieslēdzas automātiski, kad tiek atvērtas cepeškrāsns durvis. Iespējams izslēgt. Jo vairāk stikli cepeškrāsns durtiņās, jo ilgāk un labāk saglabāsies siltums. Gāzes plīšu galvenie tīrīšanas veidi ir: Easy to Clean, Pirolītiskā un katalītiskā pašattīrīšanās sistēma. Katalītiskās pašattīrīšanās sistēmu cepeškrāsnīm ir īpašs emaljēts pārklājums, lai novērstu traipus. Pirolītiskās tīrīšanas sistēmas izmantojot augstu temperatūru netīrumus pārvērš pelnos. Easy To Clean sistēmu cepeškrāsnis ir viegli tīrīt ar vienkāršu lupatiņu, jo tās īpašo poru pārklājums atgrūž netīrumus un taukus. Ļauj iestatīt vajadzīgo ēdiena pagatavošanas laiku, kā arī norāda, kad tas beidzies (ar skaņas vai gaismas signālu). Pannu (paplāšu) skaits, kas plītij ir komplektācijā. Zem cepeškrāsns ir izvietota atvilktne trauku un citu piederumu uzglabāšanai. The function helps to soften the most persistent dirt and greasy stains, making cleaning the oven chamber even simpler. Specially designed construction of burners allowed to significantly increase their efficiency. Thanks to this, you will save up to 35% of the time and up to 17% of gas consumed while cooking your favorite dishes. The oven door both from the outside and from the inside are made of full glass and without screws and bends, which makes cleaning easier. On some models, it is possible to remove the inner pane for more thorough cleaning. Good roast, this roast evenly baked. The spit in Beko ovens / ovens is a guarantee of an ideal dish from all poultry, which you will not need to look after all the time. Just prepare a roast, set the right program and enjoy a delicious meal for the whole family. Fast heating Booster is a function that significantly facilitates burning. After it is switched on, the oven uses all available heat sources to quickly reach the set temperature, and then returns to the set cooking mode. With this feature, we do not have to worry that we forgot to warm up the oven early enough. The simultaneous use of an oval heater and fan guarantees an even and optimal baking of each - even very large - dish. Hot air also allows simultaneous use of several levels of the oven, thanks to which it is possible to bake even a few servings at once. 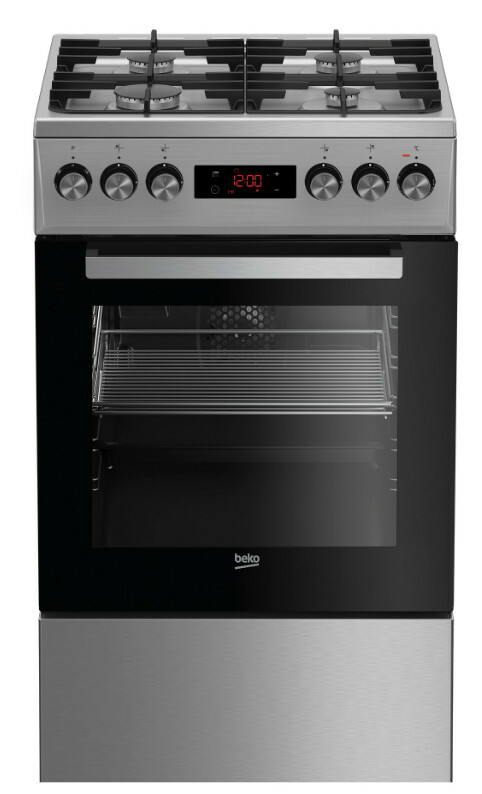 Intuitive display and ergonomic knobs allow easy management of the oven. Thanks to them, we will quickly select the necessary function. In addition, the display fits perfectly into the modern aesthetics of the product. This function is ideal for grilling meat, sausages, toasts or fish. Meat and fish due to high temperature and grill function do not lose their nutritional value and do not dry out. The grill allows you to obtain the effect of a crispy crust and a juicy interior of the dish. Are you afraid that your dish will land on the floor? Forget about this nightmare! Provide your pots and pans with maximum stabilization. Cast iron grids also guarantee durability and strength, regardless of the length and intensity of cooking. Child lock:Thanks to this function, it is possible to lock the buttons or knob in case the child plays with them. It also prevents accidental changes during the operation of the oven. Stainless steel resistant to fingerprintsSome oven models have a control panel made of finger-proof steel. Thanks to the special coating, the device is always clean, shiny and with no signs of touching. A spacious storage space for kitchen accessories. Beko cookers have a spacious and comfortable storage space, which is an ideal place for storing kitchen accessories. Protection. In order to increase the safety of using BEKO gas stoves, an automatic ignition system and an anti-surge gas system are used. In the event of a flood or a blast of air, the gas stream is automatically shut off. This is the standard for BEKO products.